mega thanks once again to AOF! he recently sold me talking victors big splash, an engine that has eluded me for years. he also sold me the shell tanker and included the two containers, a lovely surprise. thanks, shaun!! i got this for $12 from a charity shop yesterday. mostly complete, missing the driver and tree. engine is untested, but everything looks in such good shape i dont see why it wont work. i also bought a 70s meccano/hornby clockwork percy this morning, one of the first HO releases for the thomas and friends range. should be here next week, along with a couple of other buys, one which is destined to end up with nigels. these are starlink game pieces, one is an exclusive called startail. it was that piece that nigel wanted. and he will be able to tell you more about the game... i know nothing! Very Nice Sun...aren't you running out of room in the attic? That vintage Tomy box looks in fantastic condition. Aren't those the really high sloped rails with the cog teeth on the sides? That Clockwork Percy is nice looking, is it quality built, plastic/metal? Why do they call it clockwork, is it because of its mechanism? Wow Sun, that a really nice and varied haul! I especially like the Shell tanker and shipping containers but it’s all really cool. super, the attic is so full that during earthquakes i dont risk being under my door frame anymore LOL. one big one we had, i ended up on the front porch, worried the ceiling would collapse. we did reduce a lot of weight last winter when i was off work for several months. i spent hours up there each day having a jolly good chuck out, and mum did hers as well. still lots to go, but no where near as heavy as it was. i just want to spread the tubs of tracks out more and put the different ranges back into their spots. now i am off again for 6 weeks or so, i will go back up and see what i can do to improve things furthur. 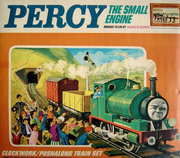 the percy is clockwork as he has a key to wind him up. likely a metal frame with a plastic body, but i dont have him yet so cant say 100%. i also have a similar vintage thomas, along with newer versions of both characters. yes, the slopes are the old cog teeth style, and both female connection points are in the great shape. many end up broken on one side or another, so to get mint ones is rare. OTR, thanks. i like the shell tanker as well, one i didnt have yet. oh, is it O gauge? i didnt realise. lol. just assumed it was HO scale, lol. thanks, star. Reading what Star says and watching the video, Sun, you may have something there especially in that fine condition. Did the key come with it and was the box included? Current time: 04-21-2019, 04:24 AM Powered By MyBB, © 2002-2019 MyBB Group.